With a fridge full of veggies and meat I am rethinking what the star of my meals will be. I was raised on a diet of meat and potato’s Now I’m not saying that there wasn’t veggies as part of every meal but the real star in my house was the potato! Or maybe, just maybe in my mind potato’s where the stars. Growing up I spent a summer with my Grandparents visiting relatives in Manitoba, My Great Baba and Aunts and Uncles. My favourite part of all the time I spent out west that summer was dinners on my Great Aunt and Uncles cattle farm. Each evening we would go into the garden and pick the veggies that would be used for dinner…and what do you think we ate allot of, you guessed it potato’s With my new adventure of no potato’s, rice, sugar or refined grains I am learning a new way of cooking. 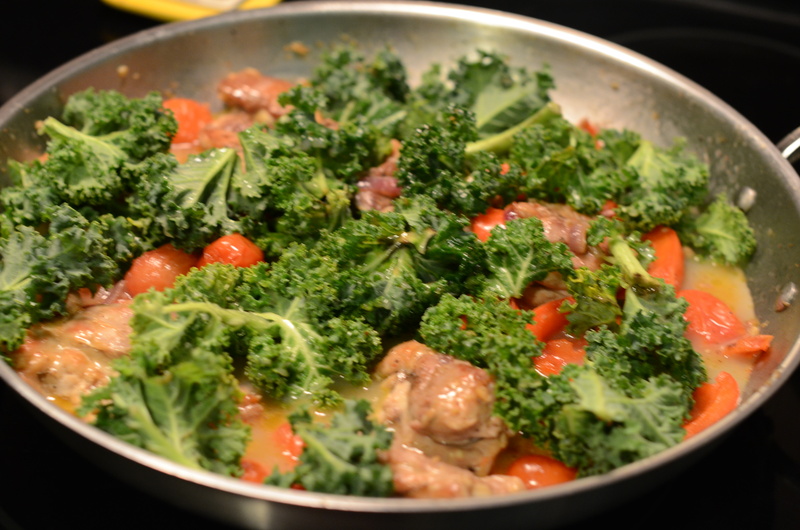 This week one of the dinners I made was a simple dish of braised chicken thighs with kale and tomatoes. It was delicious and filling! Add tomato’s cover chicken and put in oven at 350 for 1 hour. Remove from oven place back on stove top and mix in the kale. Let kale steam for a few minutes with chicken then serve.